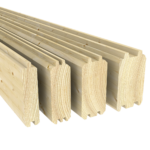 Structures with 28mm thick walls are supplied with Basic doors and windows. Structures with 40mm thick walls are supplied with Classic doors and windows. Structures with 58 or 70mm thick walls are supplied with Supreme doors and windows. 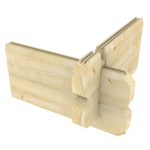 Foundations beams are always made from pressure-impregnated wood. walls also feature threaded metal rods. 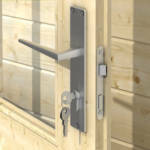 Thresholds on all our models are fitted with stainless steel plates to reduce wear and tear. All models feature interlocking corners, making the construction robust and easy to assemble. 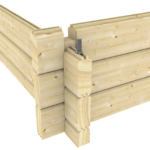 Depending on model and size, our walls are 28, 40, 58 or 70mm thick. 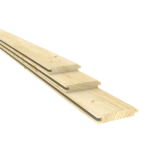 Roofs are made of 18x110mm tongue & groove roof boards. 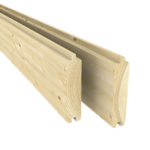 Models with 28 and 40mm walls, use this also for flooring. 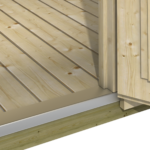 Models with 58 and 70mm thick walls feature 28x150mm solid spruce tongue & groove flooring. 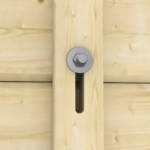 A robust door handle and lock is always included as standard.